Our cedar log cabin in the heart of Calgary provides quick access to downtown, the Bow River, and the Rocky Mountains. The home and property have had renovations and upgrades that offer a comfortable mix of contemporary amenities and original features. This listing is for the main floor of the home, providing a pleasant retreat for any time spent in Calgary and the surrounding area. We are located on a quiet residential street with minimal traffic. We look forward to making your stay at Inner City Retreat as you would expect in your own home. As such, we will be readily available for any questions, comments, or concerns that you may have. Details regarding check in will be discussed upon booking. Please note that the home is not barrier-free accessible. The basement is not available for the use of your stay. Our home is located in a quiet community [Spruce Cliff] with a diverse group of neighbours, ranging from original families from the 1950's to young families with the next generation energizing our community forward. We are a short walk away from the Douglas Fir Trail which offers a system of hiking and nature trails along the Bow River. There are also some unique shops and an art studio nearby to do some shopping or grab a coffee. Our central location provides quick access to various hot spots in and around the city. There is ample street parking, we are in the Car2Go zone, and Uber rides are readily available. City taxis and public transit are also available and easily accessible. Michael and Laura are both professionals and are raising a family of 2 girls. We enjoy golfing as a family, at local courses as well as in our own backyard! Michael is an avid mountain biker and has great trail recommendations. Laura enjoys gardening, fermenting and being involved in the community. We love this house and want to share it with others! We chose it for its central location, proximity to downtown and green space, especially the Douglas Fir Trail, and the warm and cozy feel of the cedar logs. We spent many years doing renovations to enhance the unique qualities and upgrade the amenities. 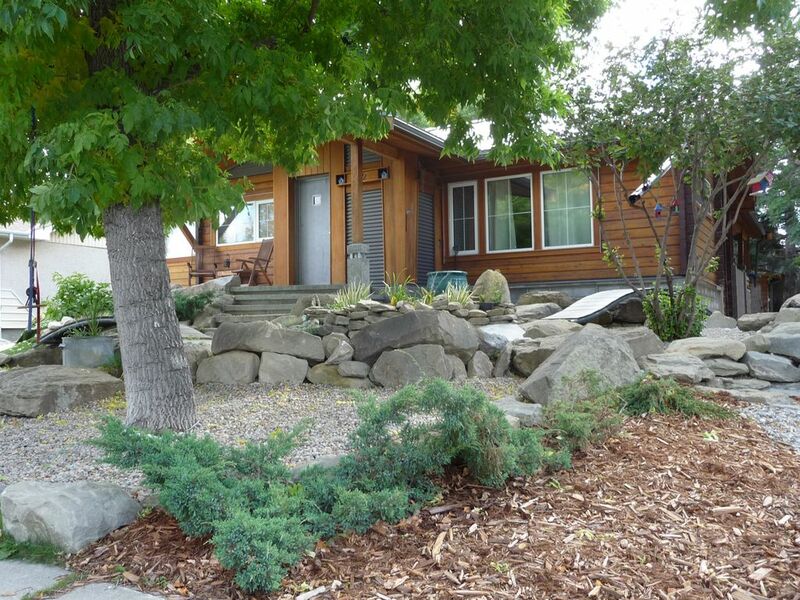 Our home is a log cabin retreat in the heart of the city. It doesn't get much better than that! toilet, combination tub/shower, Cast iron tub, 5' in length. While we do not have a river view, we are a short walk away from the Douglas Fir Trail and the vast system of pathways along the Bow River. Street parking for up to 2 vehicles. Putting / chipping green in the backyard is a 3-hole section of a larger 9-hole green that is shared between backyards. Availability will determine extent of use at the time of your stay. Coffee, tea, sugar, salt and pepper. Dishes, glasses, cutlery, cooking utensils, pots and pans. Full kitchen with eating bar. Large dining room off the kitchen. Table seats 4, eating bar seats 2, infant high chair. Patio doors that provide access to outdoor patio. There is also a cozy seating area. Please do not remove books from the house so that future guests may also enjoy them during their stay. Large patio area, with an upper and lower level. Access from dining room. There are stairs to get into the house, as well as to access laundry facilities in the basement. If you have mobility restrictions, please contact the host to clarify is the space will be suitable for your needs. Inner City Retreat is perfect for a family getaway or the business professional. It is fully furnished and should meet your needs. If not, please speak with Michael and Laura and we will do our best to accommodate you. We are centrally located, making An Inner City retreat ideal for your family holiday/business trip. How exciting that Calgary has made #20 on the NY Times list of places to go in 2019! There really is so much to see and do here. Please contact Laura and Michael for specific recommendations.